But then we have Broadside. Hey, remember that one time Devastator picked me up? That was cool, right…? Right guys? Guys…? Broadside never really got to “do” anything of note in fiction. In the cartoon and the Marvel US comic he was little more than a generic troop. The Marvel UK comics expanded upon him a bit by letting him be part of the Wreckers, but he often gets regulated to just being there. 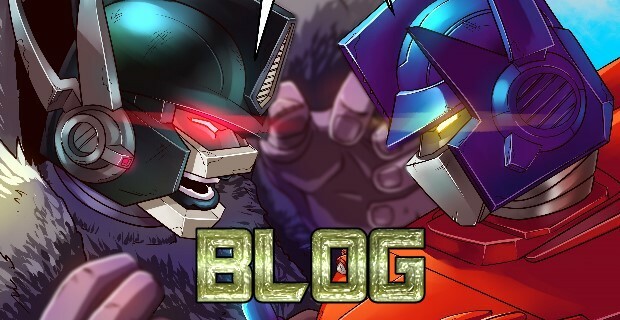 In IDW’s comics, he’s crowd filler. His bio doesn’t really help matters, either, stating that he’s afraid of flying and gets seasick on water… making his alt modes problematic. And yet… I had to have him. The completionist in me screamed that I “needed” him, as he was the only one of the six triple changers that I didn’t have a modern version. So, what are my impressions now that I have the figure? Mixed. Let’s start with the good aspects. The robot mode evokes power. 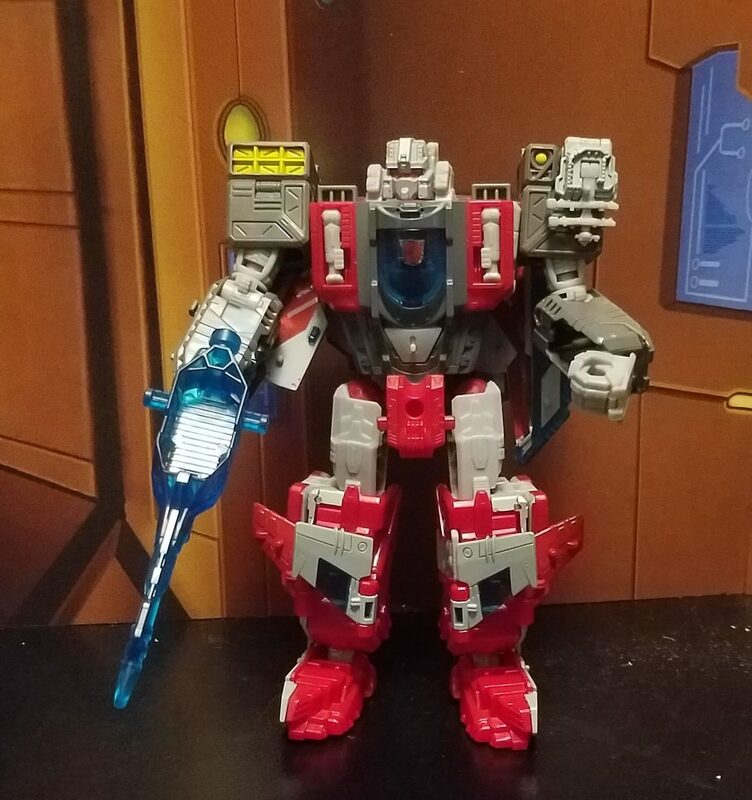 Broadside looks like a tough bouncer, and seems more in line with the gentle giant we see in the recent IDW comics, rather than the lean bean pole of Generation 1. The arms and legs have the usual good range of motion, and the headmaster gimmick does not get in the way of the head turning. 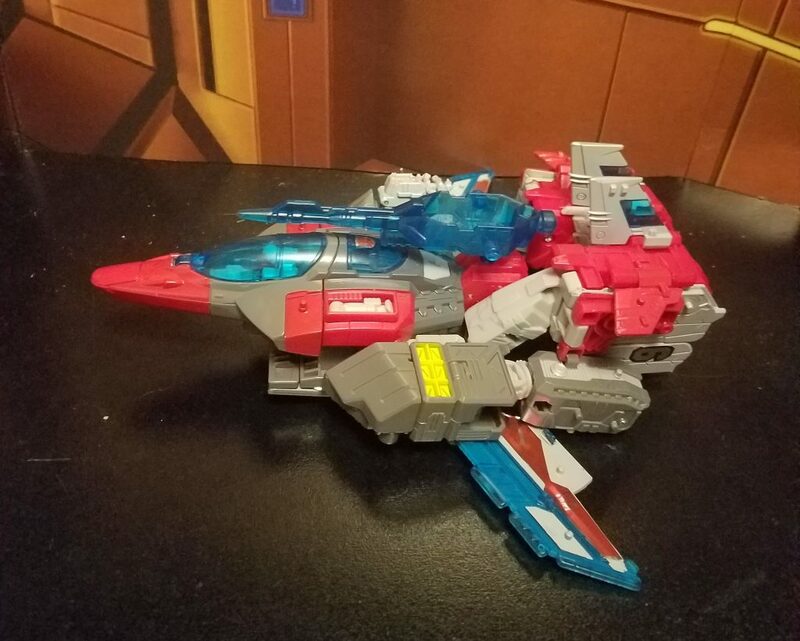 The colors work well, especially the clear blue cockpit against the red and grey body. The main issue of mobility comes from a lack of waist swivel, but as this was also missing on Titans Returns Astrotrain and the recent Thrilling 30 Springer figure (both excellent triple changers), I can’t fault it too much for this. 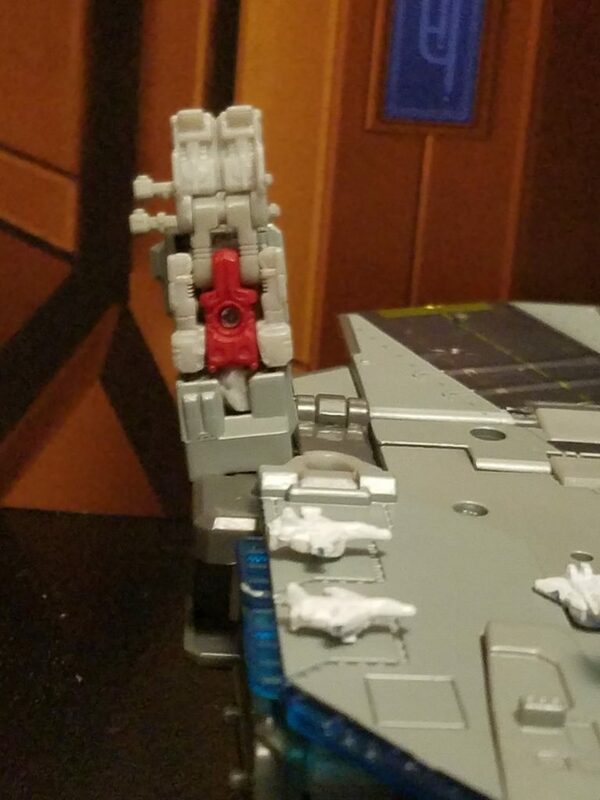 Broadside’s second mode is an aircraft carrier, with the number “36” on its tower and runway (though the 36 is printed backwards to how the NAVY places numbers on carriers). It is unclear why they went with 36 rather than the original G1 98, but I theorize that they might have seen the 98 upside down as 86 and thought it looked like 36 on a reference photo. A recent sticker set–available here from Toyhax–does fix this, as well as generally sprucing up the figure. There aren’t many Transformer aircraft carriers (after all, how many stories take place on water? Why would they need to since most of them can fly across oceans…?) 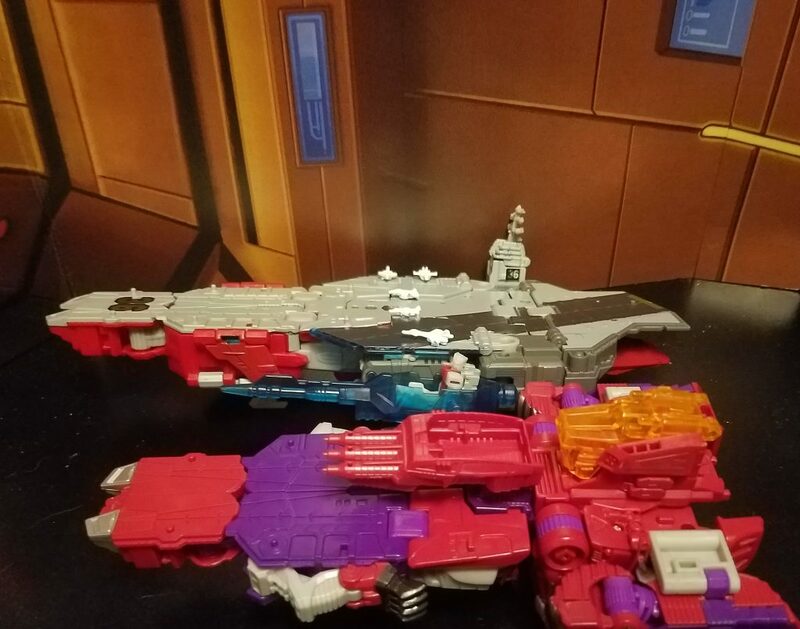 with the exception of Flattop and Tidal Wave (who is scheduled to be released as a recolor of Broadside), which makes this mode somewhat unique. 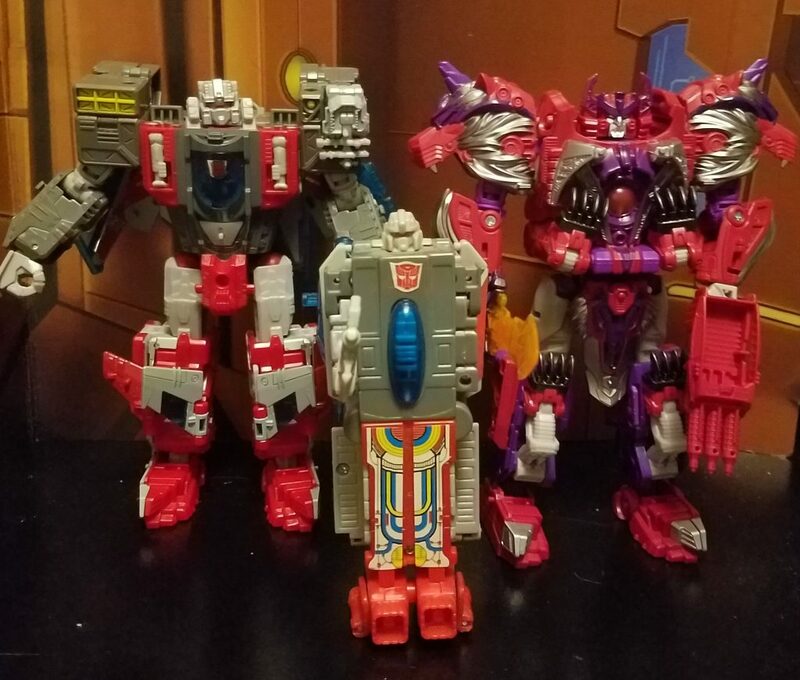 You might be tempted to think that if you already have Titans Returns Alpha Trion, you’ve pretty much know what to expect already, but you would be wrong. 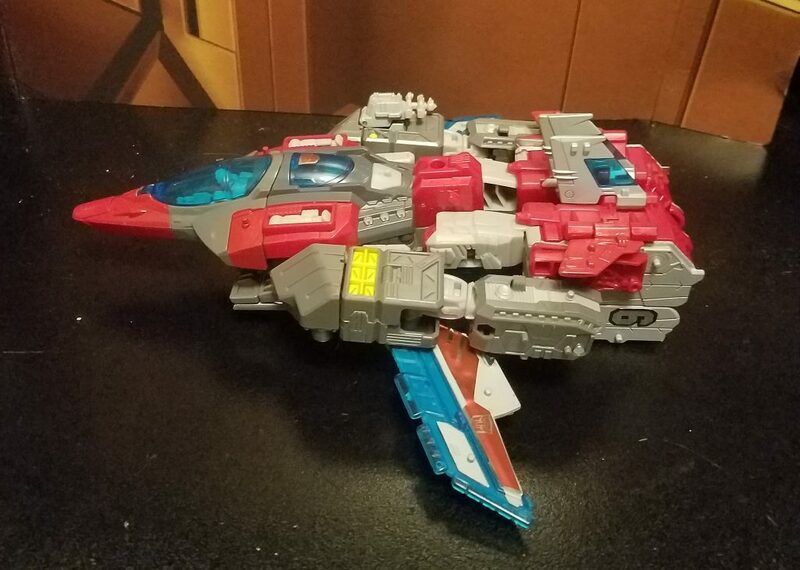 The engineering is clearly geared towards the aircraft carrier mode just as Alpha Trion was clearly geared towards the lion mode. There’s all sorts of little extras included to make this mode work such as the three different landing gear to make it sit flat in this mode, the miniature reproductions of the five Aerialbots in white (though one has to wonder what happened to Alpha Bravo), and the radar tower that can open up for Blunderbuss to connect to… in some manner or the other. Personally, I feel that Blunderbuss works best riding the Titan Master gun, attached to the side of the carrier. …there we go. Just right. 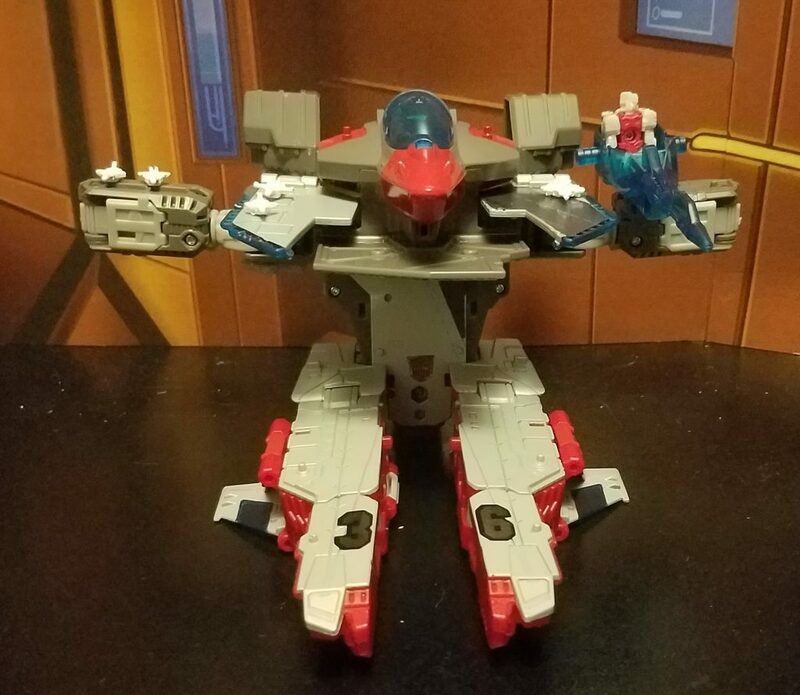 If this was a normal two mode Transformer, we could probably stop there and be fine with it being an “okay” figure, but Broadside is a triple changer, and his third mode is meant to be a jet. And it is here that the figure is weakest. What the heck is wrong with the tail fin wings? Why was it engineered backwards? Why? WHY??? This is frustrating as it didn’t have to be like this. 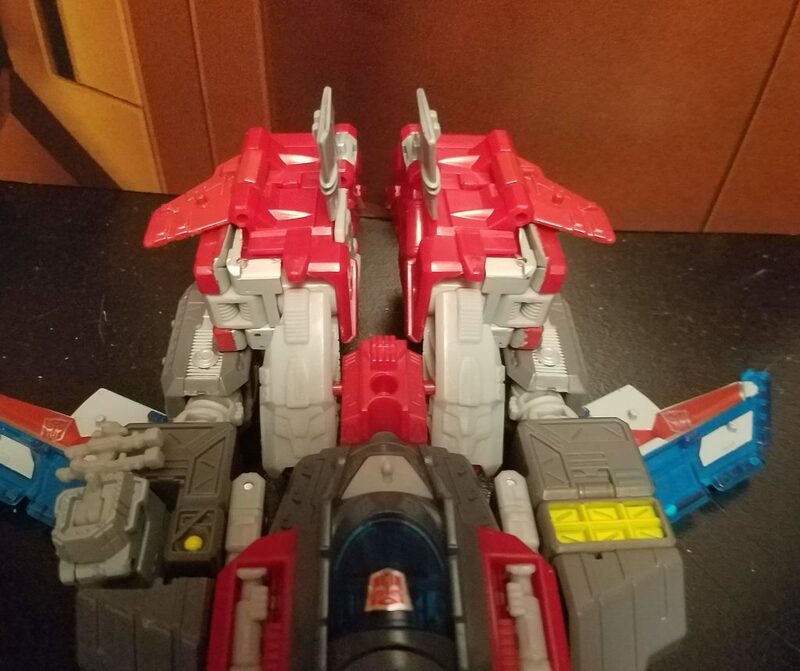 Some people have shown how easy it is to mod the figure by pulling the pins out and flipping the wings (a video of how to do this and its effect on the jet mode can be found here). 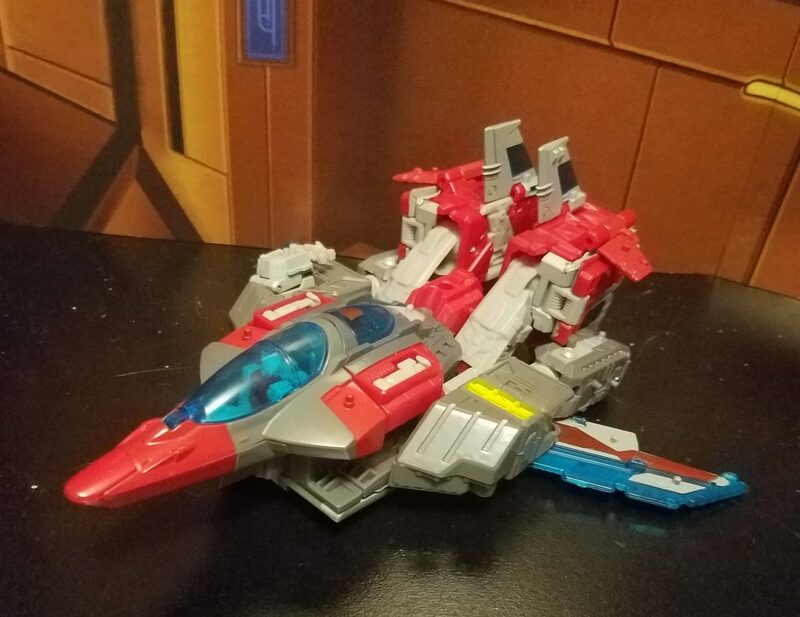 Others have played with alternate transformations that lay the jet mode flat. But they shouldn’t have to do this; a little more engineering on the legs could have resulted in an awesome third mode. The jet mode as is comes off as an afterthought. While the aircraft carrier had landing gear, the jet, strangely, does not. In addition to the backwards tailfins, the back feels far too bulky for a streamlined jet, and the gap comes off as lazy. It feels as if there “should” have been a waist swivel, and a collapsing of legs. Taking the thigh gab to a whole new level. 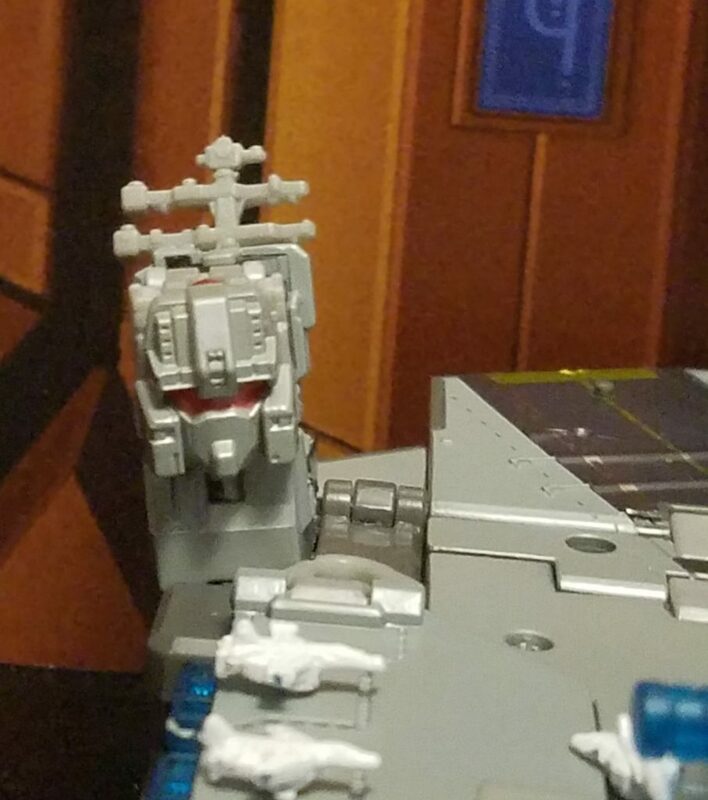 The Titan Master Blunderbuss does fit nicely into the cockpit in this mode, and the clear plastic of the wings is a nice visual touch to tie into the tail wing. The gun weapon is meant to peg on top in official pictures, but can also attach under the cockpit as well. Either placement, however, will feel forced. The Titan Master guns, in general, only tend to shine if used for unofficial base modes. Part of me hates Broadside, as I’m frustrated by how good it could have been. Another part, however, loves him, as the awkwardness of the figure highlights the potential character personality. Even the name of his Titan Master, Blunderbuss, seems picked to highlight the fact that Broadside is a clumsy mess of a character. So, would I recommend him as a figure? Yes and no. 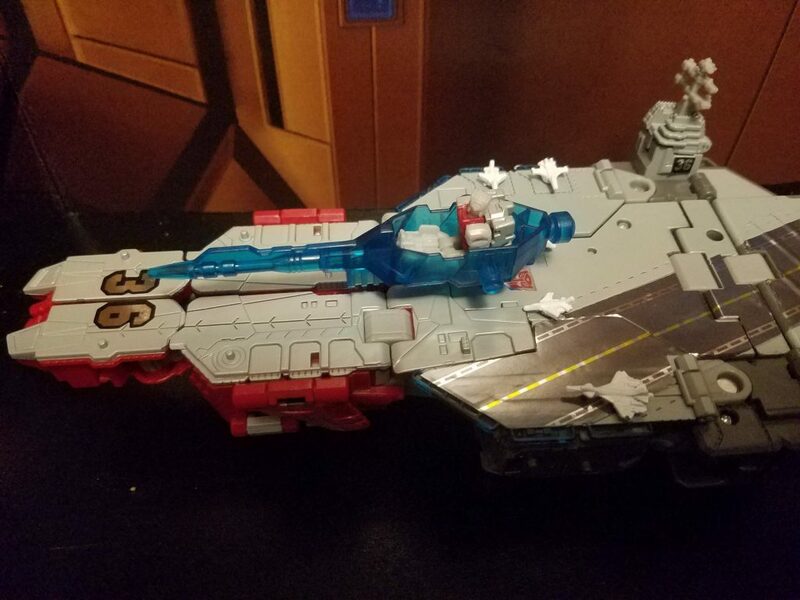 If the robot mode grabs you and / or you think that aircraft carriers are awesome, go for it. 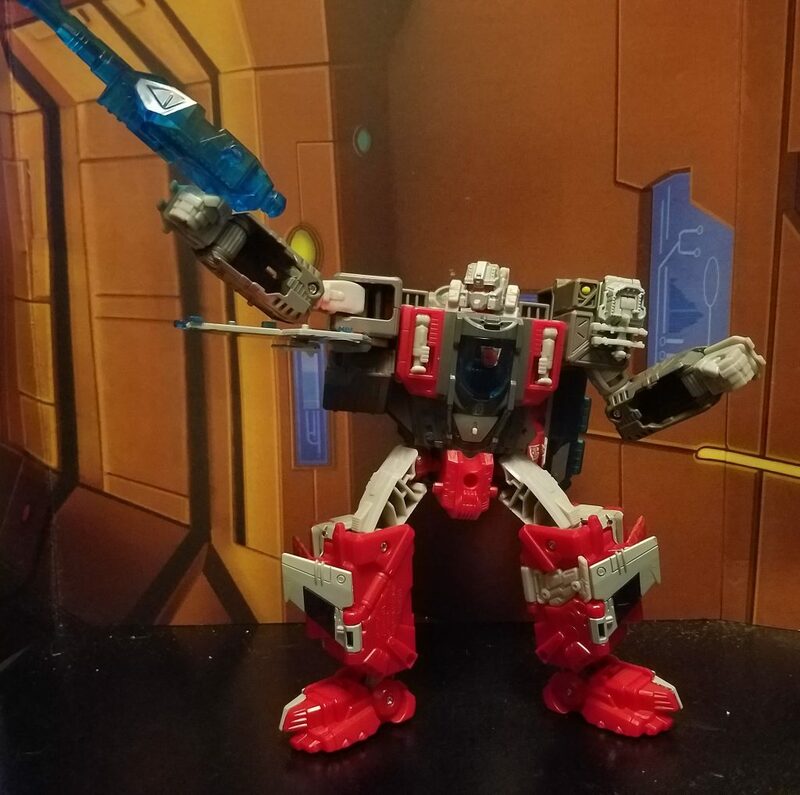 If you are trying to fill a hole in your modern G1 figure collection, definitely grab it as there probably won’t be another shot at Broadside as a character for quite some time. If you are looking for an investment, I would also recommend it as you can get your sweet bippy that people are going to lose those little white planes and a “complete” Broadside will be worth a pretty penny. However, if you feel very little attachment to the character, and plan on getting the eventual box set that has him recolored as Tidal Wave… it might be a pass. 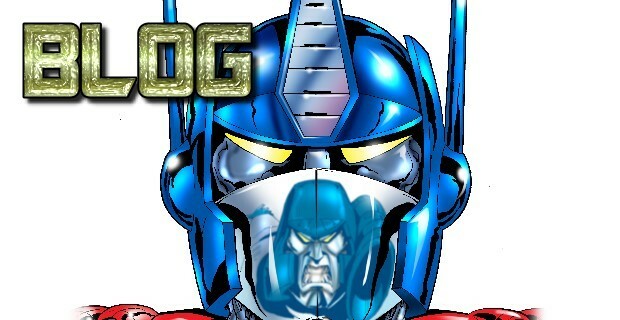 *Sigh* Yes, the G1 figure is a knock off… but really, does it matter? It’s freaking Broadside.